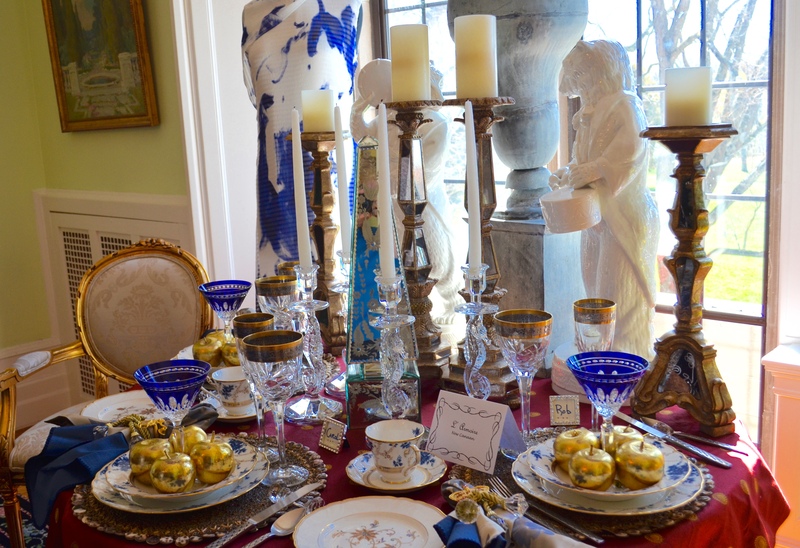 It’s time again for our popular town fundraiser, Tablescapes at Waveny! 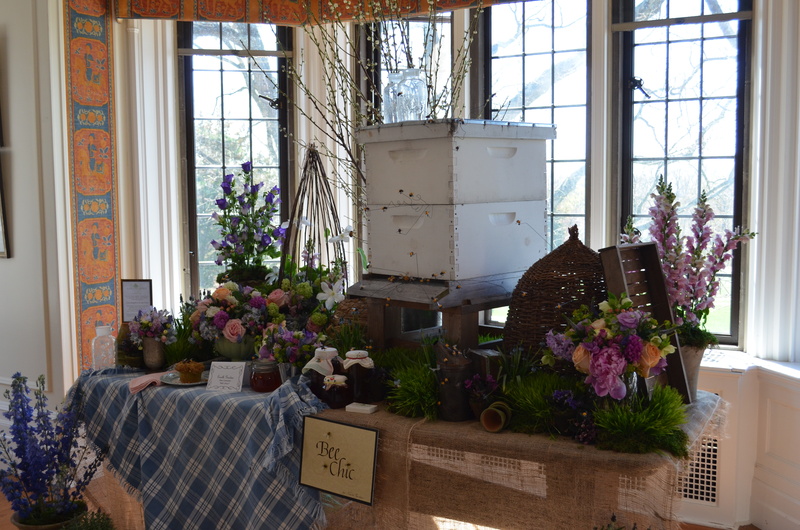 The New Canaan Beautification League members have been busy as bees this spring, cleaning up little plots of land scattered throughout our town, and this tablescaping event provides enough funds for them to beautify our town in a most glorious way! 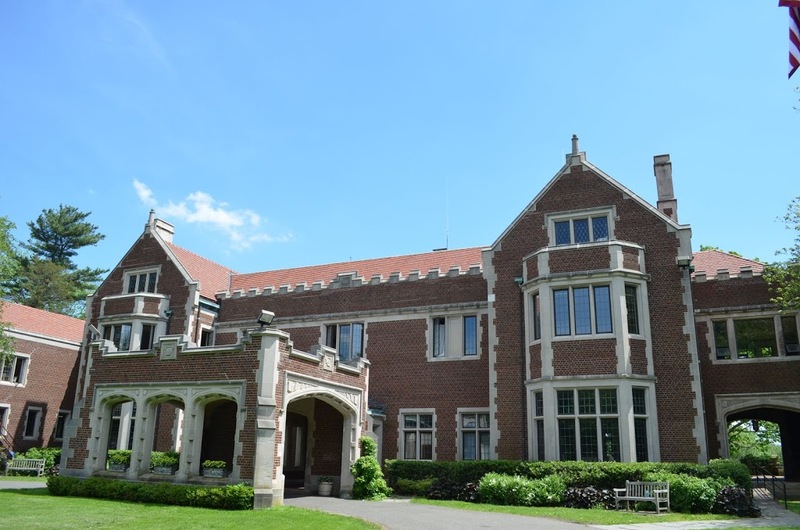 Waveny Park, which is home to Waveny Mansion, consists of many acres of gardens and woodlands and was designed by the famous American landscape architect Frederick Law Olmsted, Jr. of Central Park and Biltmore Estate fame. Waveny Park is now one of our most popular town gathering areas, home to our summer theater, the town pool, running trails, a dog park, playground, exercise field, soccer and baseball fields, and plenty of open space for summer fireworks and other festivities. 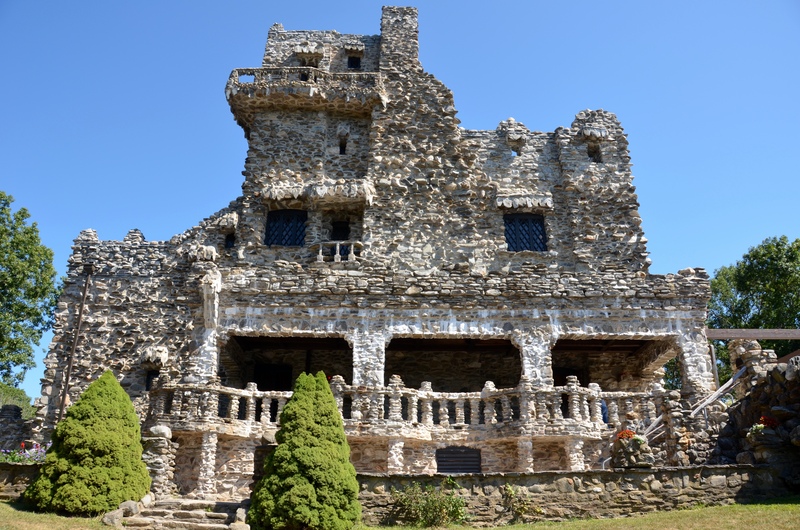 The Mansion (officially it is Waveny “House” but only in 1912 could this magnificent structure be considered a “summer cottage”) is mostly empty inside so it can be used for fundraising activities and celebrations. 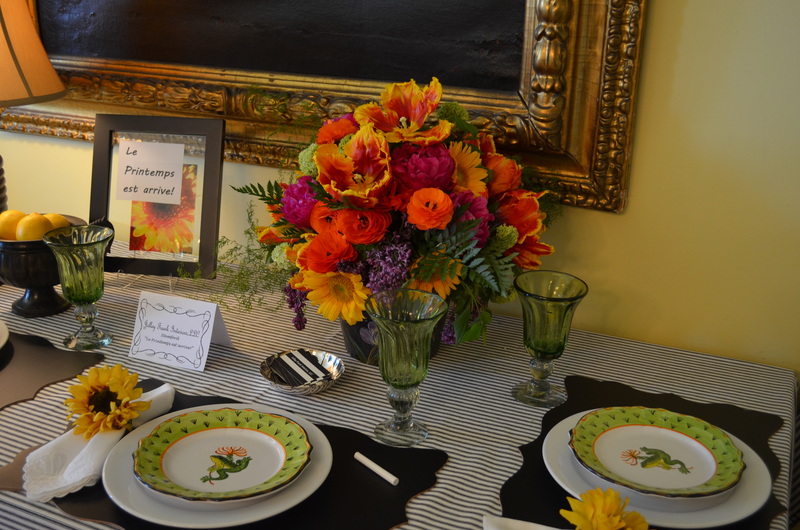 The Tablescapes fundraiser is one such very popular event. Come along for a tour! 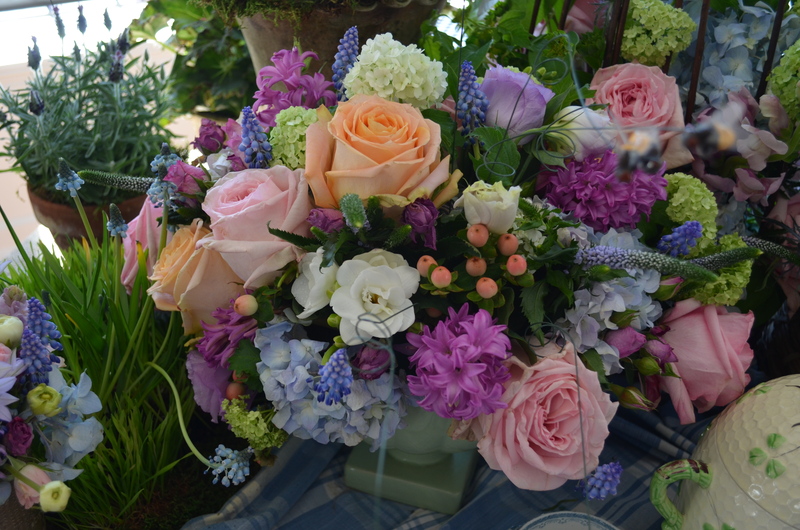 Although the League has recently changed its name it is really a garden club, full of dedicated and talented gardeners, so most of these tablescapes really emphasize the importance of a beautiful floral arrangement, with the dishes included as an afterthought. 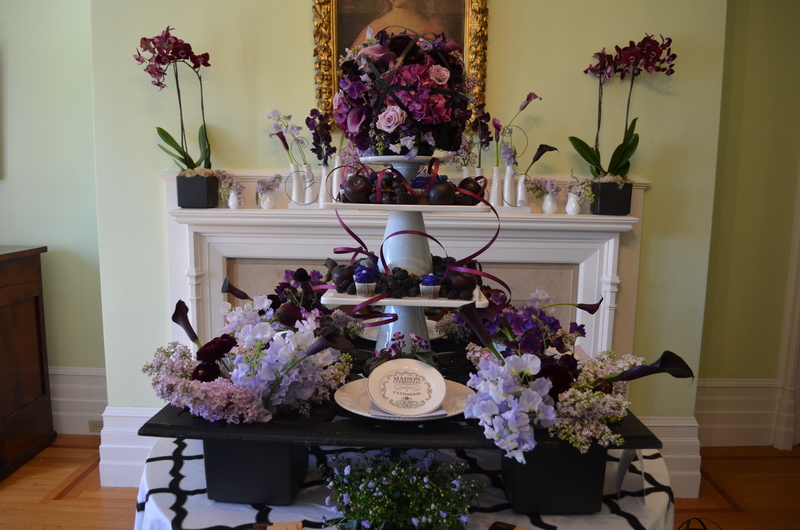 As usual, I wanted to tweak every table a bit to straighten up or show off the incredible dishes, but the League Ladies stand guard and no amount of distracting them with talk of the flowers was enough for me to get my hands on the dishes! I may have to finally give in and join them to have access to the goodies for the 2017 event, although I think all my gardening time still needs to be spent on my own yard. 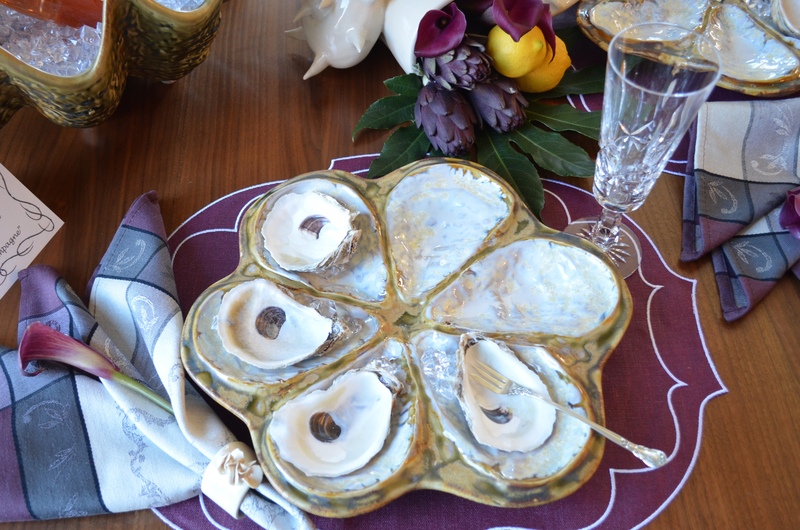 Lately I’ve been obsessing over oysters and oyster plates, so I wanted to pull up a chair at this table. 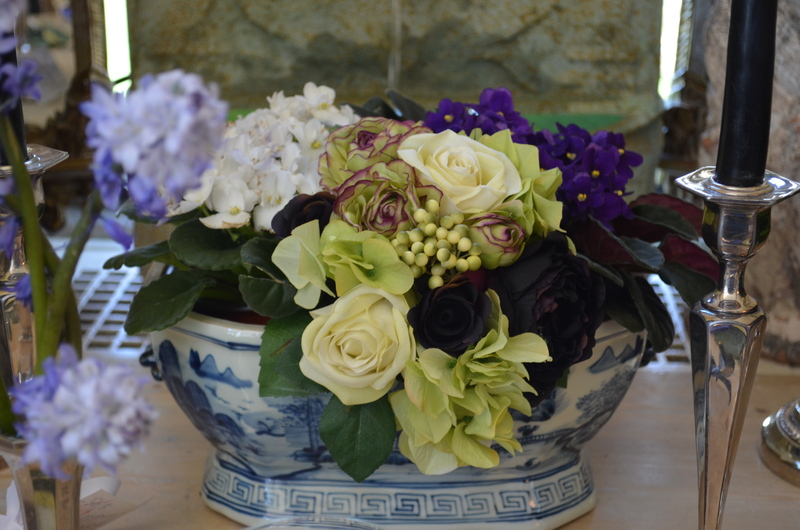 Don’t miss the artichokes, lemons and purple cala lilies in the centerpiece. The event theme this year was “Trés Chic” although “chic” is the last thing New Canaan aspires to be. (I hope we don’t get that as an assignment for an upcoming Let’s Dish party!!) 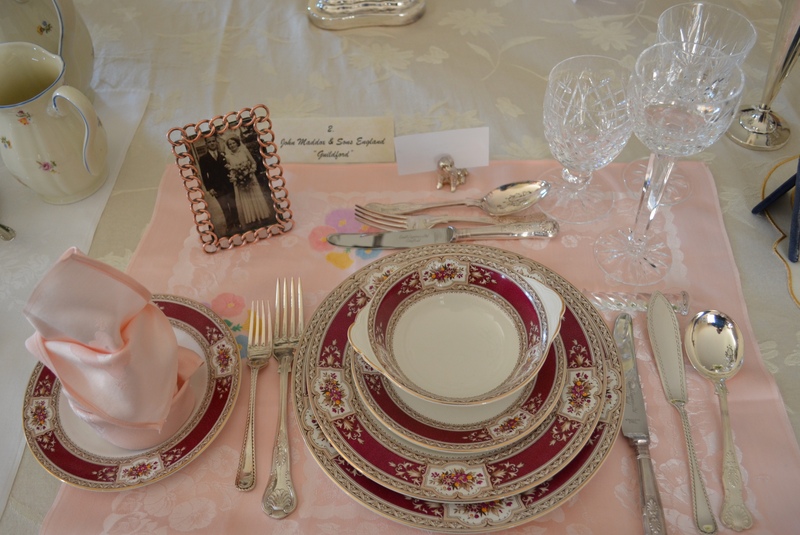 This table was sponsored by a (very nice) local dress shop and set by a noted professional table and event designer. Does it qualify as chic? Well, I don’t know, but I did notice that while “flora” is missing here (I don’t count the golden apples!!) we do see “fauna” in the form of monkey napkin rings and seahorse candlesticks. Actually the table was quite striking in real life with a view of the fields out the window and neat-o placemats that I did manage to touch. One of the highlights of the event is the “heirloom” table set on a long table in the dining room. 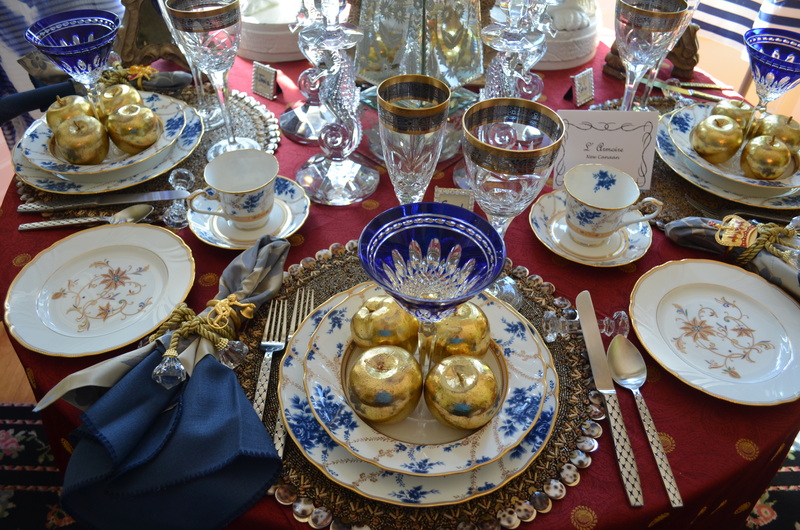 League members create a setting with family china, crystal and silver and a short history of the pieces. 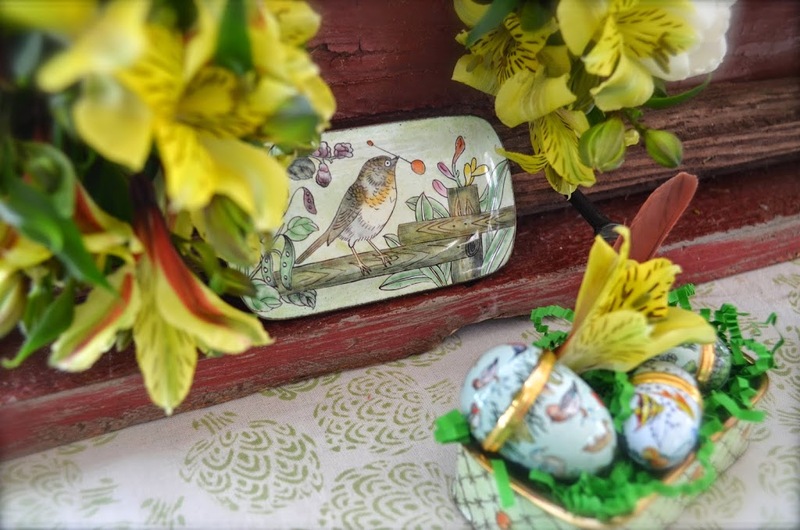 While the rest of the tables use new pieces that can be found in local stores, this table showcases mostly vintage patterns and personal pieces. This is Stolzenfels Bavaria “Streublumen” and traveled from Germany to this country when the family immigrated in 1953, in a wooden trunk made by this member’s father. 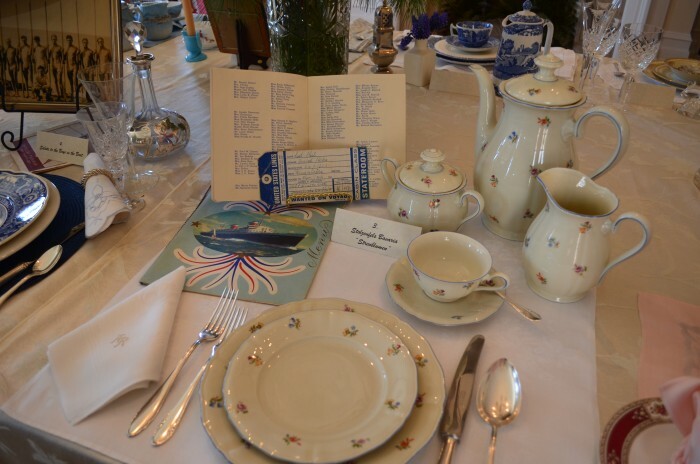 The setting includes the passenger list, menu and luggage tags from the voyage!! I loved this story. 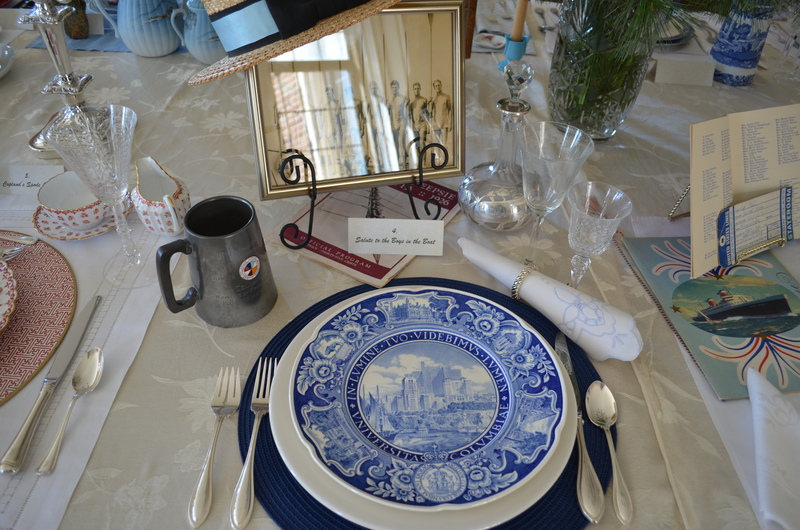 This table highlights the 1932 Wedgwood plate illustrating a scene of Columbia University. (Do you have china from your college? I do! Are you surprised?) 🙂 This member’s father-in-law rowed for their crew team and the mug was presented to his championship 1926 team. During a solemn ceremony the glass bottom of the mug is shattered at the oarsman’s death. So interesting! I also loved these three settings. The Gorham Old French flatware in the first is the same as my sterling pattern. If you are still here you will be rewarded with views of my favorite three tables. 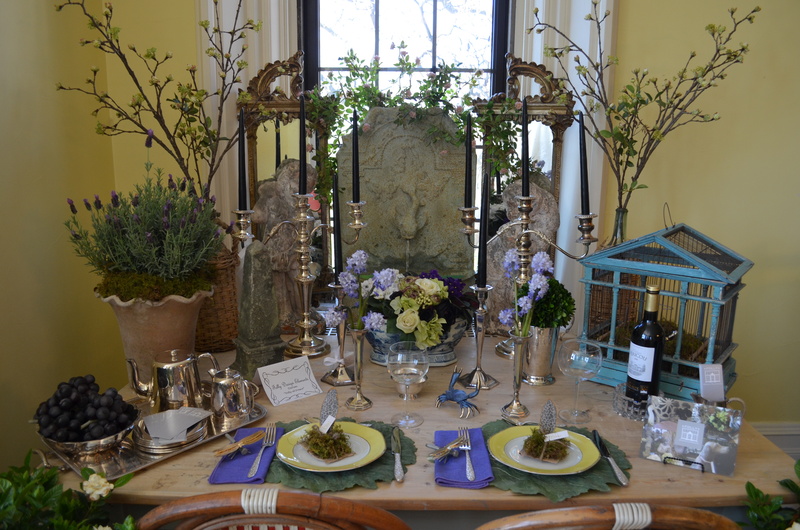 This first one was a wonderful balance of soft colors, elegant pieces like the silver candlesticks and bud vases, and rustic elements of the wood and stone pieces. The remaining two of my favorites, interestingly did not really portray a table setting in the traditional sense, and I think they were successful because these gardening experts stuck to what they do best: garden elements! 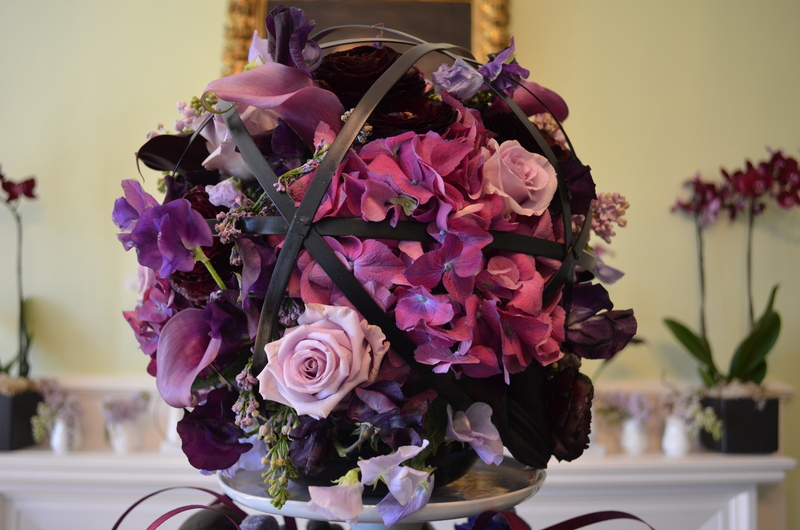 Each was created by a local florist. First, a tower of purple pleasure! This pseudo–Eiffel tower was quite striking and is built using a wall hanging as a base and cake plates for the tiers. I’ve used this florist for arrangements for my house and she knows how to do the lush display I like. This is the top of the tower. 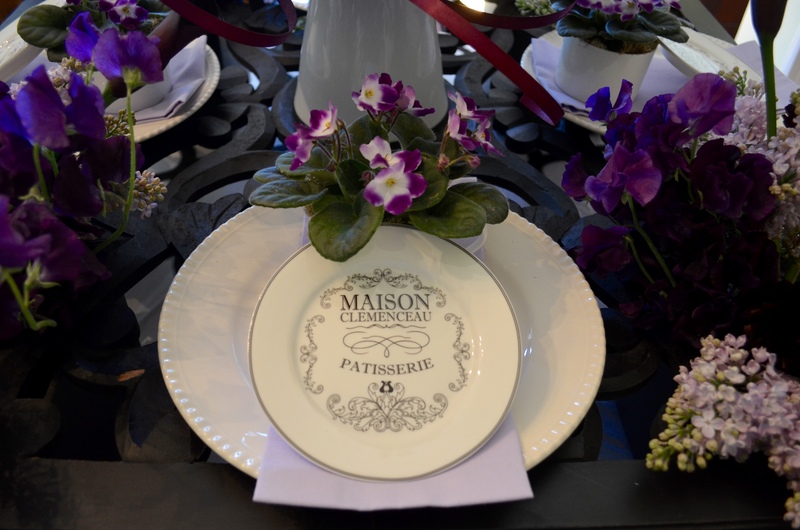 And while it would be difficult to actually sit at this table it would be fun to use these cute plates and imagine lunch in Paris with the real tour Eiffel in sight! Maybe this captures the trés chic theme! Finally, the one for which all of you bee-lovers (I know I’m not the only one!) have been waiting! Note the “Bee Chic” sign. This table was designed to draw attention to the endangered state of the honey bee population and serve as a reminder of how useful bees are in pollinating flowers and creating honey. 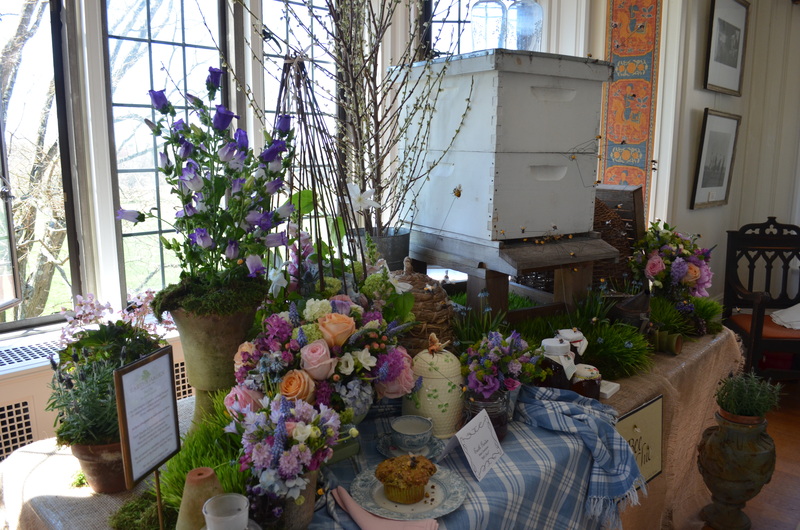 All the elements were beautiful ~~ skeps, hives, flowers of every sort, garden tools and pots ~~ and this adorable little bee/tea pot! The only unfortunate piece of this table was the attempt to add the “dish” element of an empty tea cup and dried up, half eaten muffin. I think it was supposed to look like a gardener had just had a little tea break and put her cup down before continuing on with her chores, but in this setting it just looked like the display had been pushed aside and a guest had dropped off her used cup, like you find stuck around your house on tables after a party. See the mess?? I struggled to ignore it but I really, really wanted to take it away, tidy the cloth, and put another pot of moss and flowers there. Overall, though, this was an interesting, thought provoking setting and the flowers were extremely gorgeous! 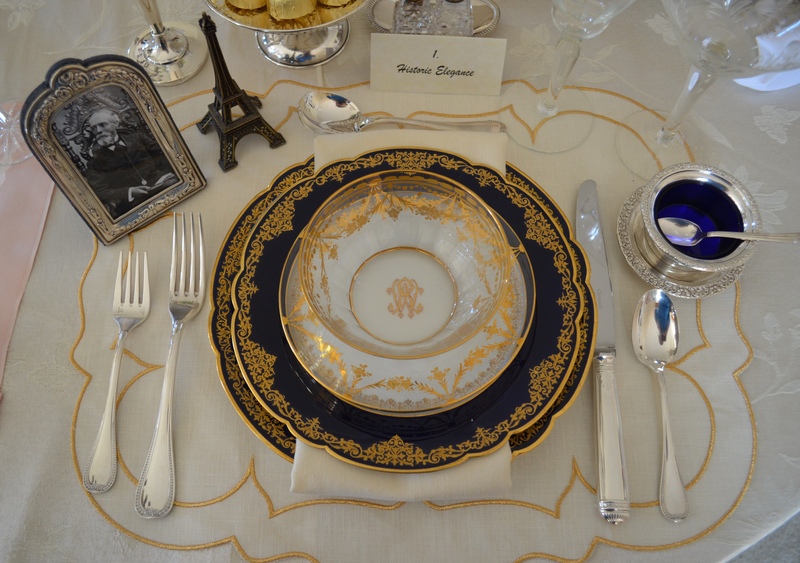 And of all the tables with the beautiful dishes displayed, this one without a place setting is the one to which I returned several times just to see every little bit. Our town is known as “the next stop to heaven” and I’ll take this opportunity to thank all the hard working ladies of the League who spend so much time and effort in helping it earn that name. So tell me, which is your favorite? Would you like to sit at one of these tables or welcome your guests to one? You can enjoy my previous posts on Waveny tables HERE and HERE. I’ve been tempted on occasion to straighten a piece of cutlery or refold a napkin from a tablescape on display, but decided to leave it alone. Thank you soooo much for all of the pictures. I just love the antique settings and the stories behind them. oh my goodness Linda, I was born in Stamford and lived in New Canaan until I was 12 and we moved to Calif. 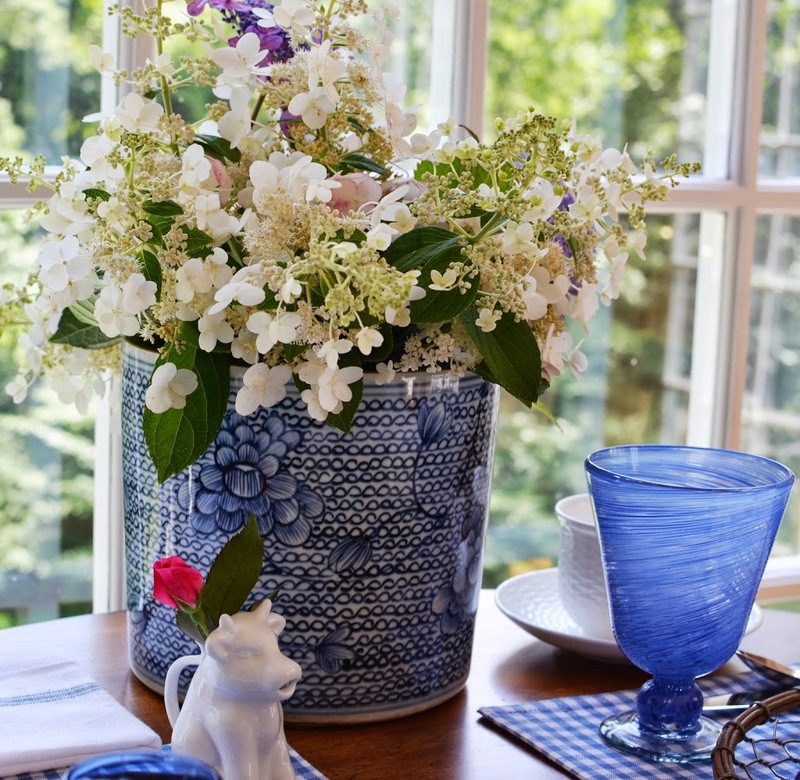 I have so many fond memories of New Canaan, and would love to attend this tablescape event! My favorite was the Bee Chic, so meaningful, yet so much fun!!! 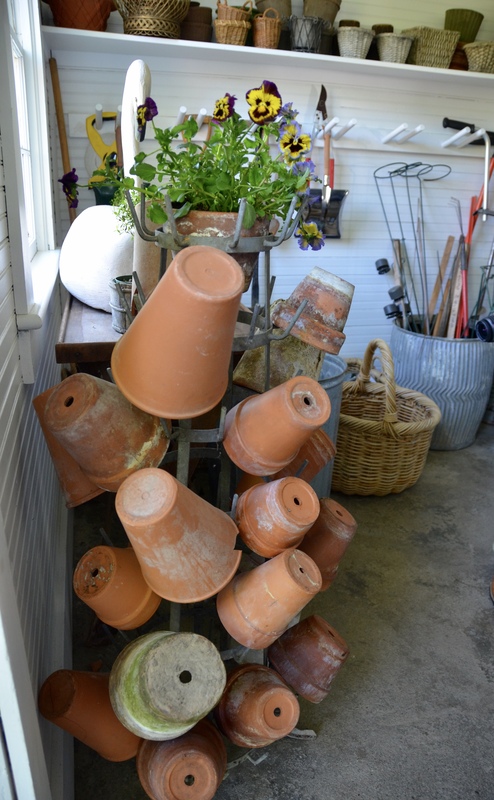 The frenchy flower tower was tres chic, and the the first of your favorite three, with all the natural elements blended with the elegant, reminded me so much of what one might find in sweet Mary’s potting shed! 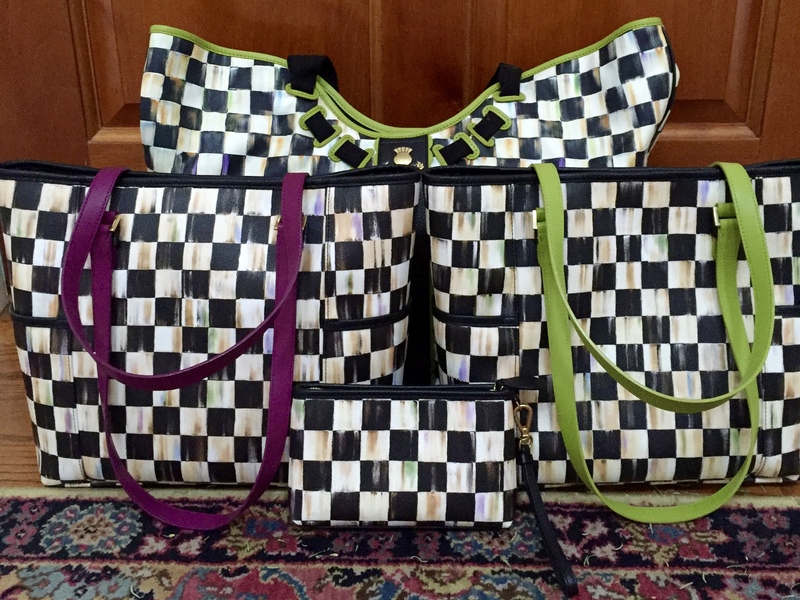 Delightful, thanks so much for sharing, and so happy to know you’re in New Canaan! Linda, when I saw the title of your post, my mouth started watering. I so enjoy the Waveny Mansion posts. You have a marvelous eye for noticing everything, like the view outside the window, and so, you are slowly training me to be a better observer. 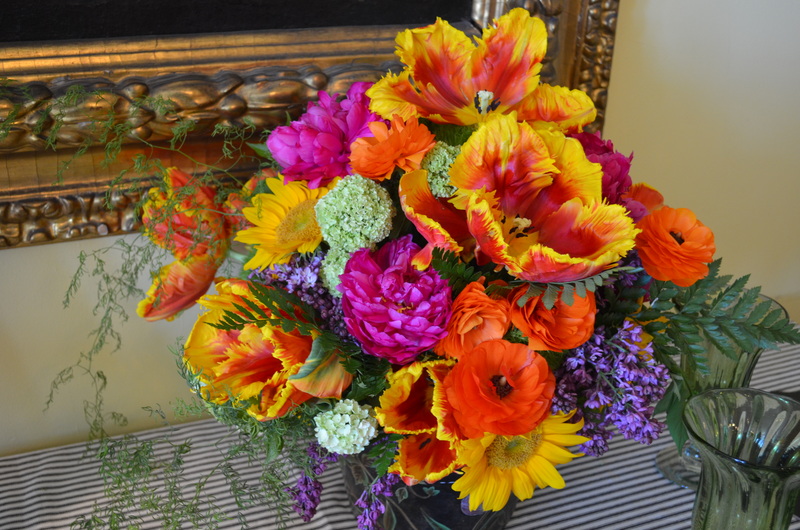 Truthfully, you could’ve stopped at the photo of the gorgeous arrangement with the parrot tulips, and I would have been completely satisfied. What marvelous colors! This event does seem to have something for everyone. 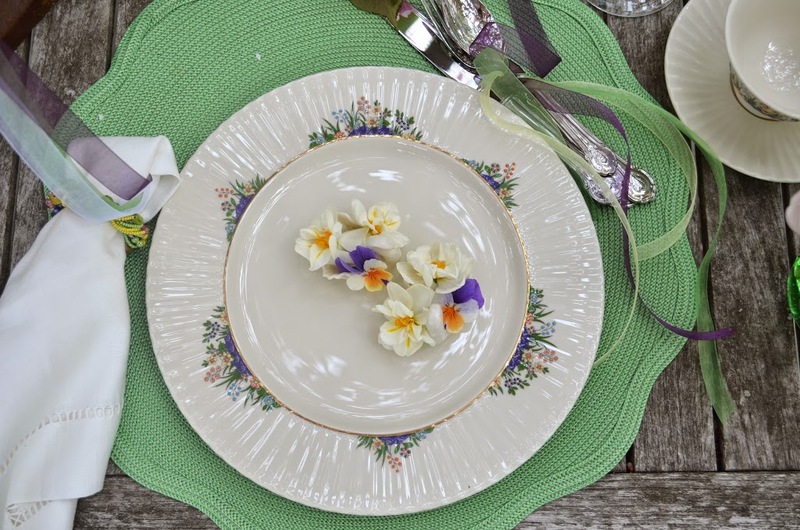 I liked the Streublumen dishes, with their quiet, Old World feel; and, of course, I love the Gorham sterling! 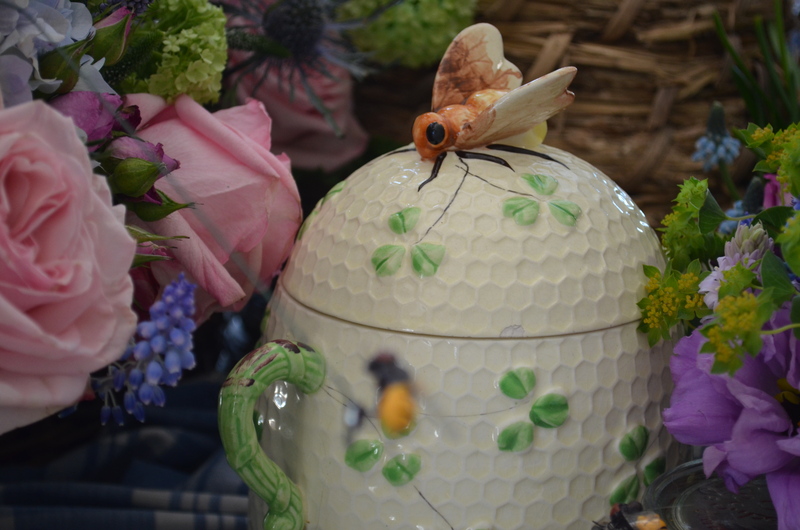 I also seem to have a “thing” for honey bees, and that adorable teapot was so, well, so sweet! I often fantasize about correcting other people’s spelling, as well as making sure that the sharp edge of their dinner knives face inward towards the plate. I’m sure that more egregious crimes have been committed by mankind, but I would like to see these stamped out in my lifetime! This post has been a delightful treat! Oh Linda, what fun it must’ve beento see all of these tables in person, although I certainly appreciated you sharing them through your photos. I LOVED, LOVED, the bee teapot…I’m swooning with teapot envy! However, the story and the dainty dishes that traveled in the trunk, just tugged at my heart. Thanks for sharing all the lovely inspiration with us. Have I told you that your blog name ALWAYS me smile. Linda, once I was able to take my eyes off the beautiful parrot tulips, I got stuck on the bee-utiful tea pot. What a wonderful event for us dish lovers! Linda, the tables are all beautiful, but my favorite was the first one, it was simple, fun and those flowers absolutely gorgeous! This tour had to be so much fun for a dish lover…thanks for sharing. thanks so much for fixing this up for me! its funny between the time i was emailing you i went to amazon and bought some chalk chargers, look how timely i was with your post! and for even more of a coincidence i just bought some new very similar frog plates this week! love the boat and trunk story, i have been reading lots of historical fiction and lately and just finished watching a show about ellis island. 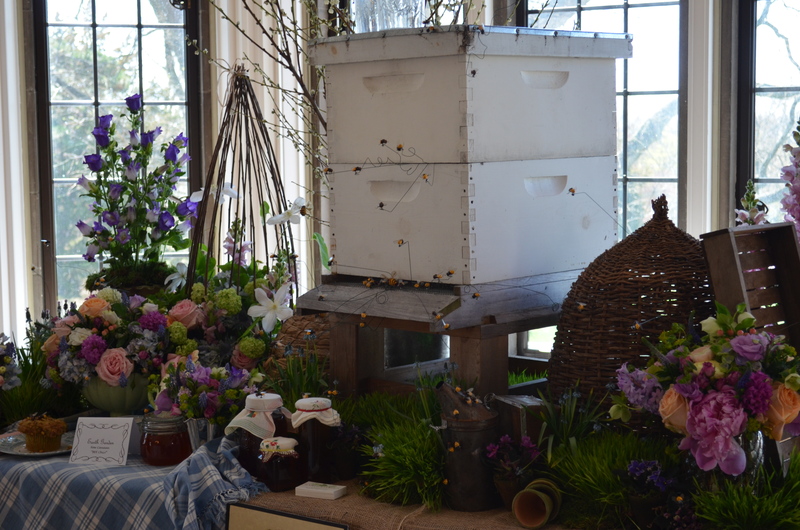 wild over the bee table, very clever! oh that was so fun and refreshing, i have had my head to the grindstone for too long! thanks so much for making your blog accessible to me again! Thank you so much for sharing all of the photos for the beautiful settings!! 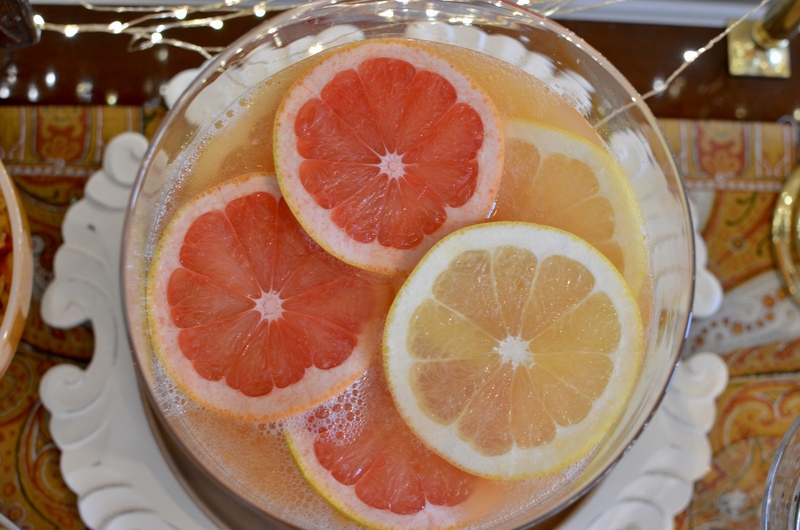 I love love love the Bee Chic table!! While I think I would have been tempted, as you were to straighten up the table cloth, the whole table is so unique -but I am always drawn to more natural elements. Next favorite it is the Tower of Purple, I love the streamers curling over and down the sides of the tower. I really enjoyed this post! lots of details! Those tables are so lovely! The floral arrangements are absolutely gorgeous! Hi Linda! Oh, what a wonderful event and the tables are so lovely. Love the beautiful centerpieces too. These are some very talented ladies setting up these tables. Thank you so much for sharing these with you and thanks for popping in to see me. 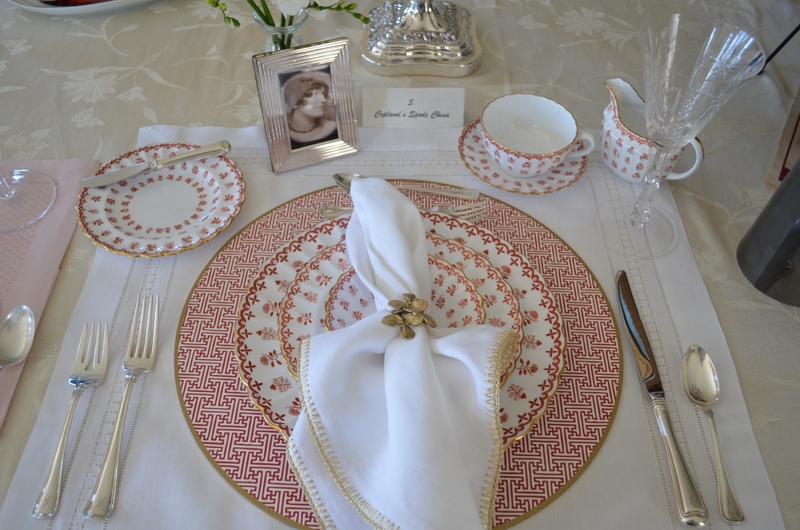 I think my fav is the one with the china and story from Germany – What a family treasure! Looks like this was a fun event – so much detail to see that I would have to spend hours there! Great post. Linda, I adored this tour. I was reminded of Judy Chicago’s long-ago book, The Dinner Party, that celebrated feminism through tablescapes. 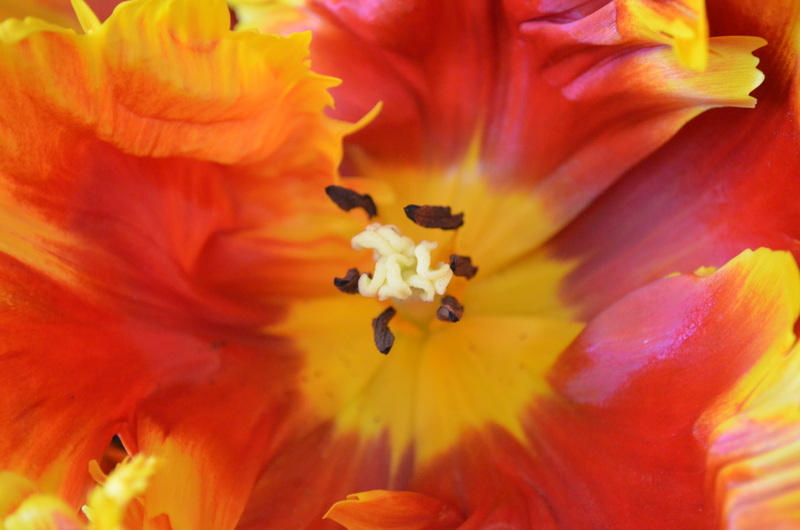 After seeing those gorgeous parrot tulips, I’m putting them on my list for the ranchburger. The natural-style table with the blue birdhouse stile my heart, but I also have a weakness for anything bee-related (we had hives many years ago). This was a delight. Looking forward to playing with you and the girls at the end of the month. Oh, that tower of flowers is fabulous! I could try that! This would be such a must do event if I lived around there. So beautiful and inspiring! How wonderful of you to share it. You did a great job on the photos! I’m so glad you took us along on the tour. I was drawn to the vibrant colors of the first table, thought the table sponsored by the dress shop had way too much on it to be “Trés Chic” and loved the pinks and purples of the tower. A delightful post.